I didn’t want to release an update so soon but it is necessary due to three issues – one caused by me, one by an UltimateBet bug and one by Winamax releasing an updated and better hand history format. PokerStars Tournaments are now imported again correctly. Sorry all for screwing up this important feature in last week’s update. UltimateBet’s (aka UB’s) all-new broken currency format is now auto-corrected by Poker Copilot. They have been showing $3.50 as $3.5. Winamax have fixed some problems in their hand history format which means that Poker Copilot, as far as my tests tell, now gives correct stats for Winamax. To sweeten the deal there are a couple of minor hand replayer improvements. 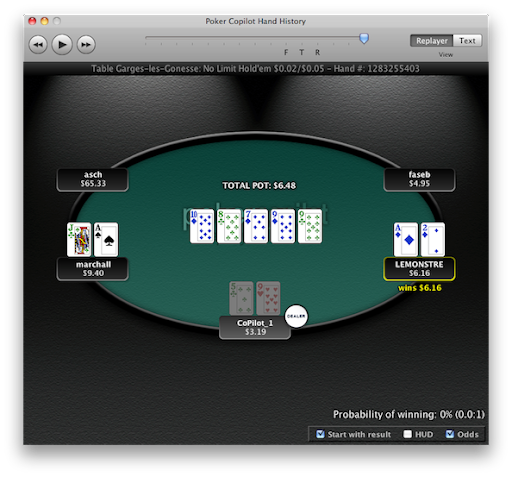 Once you fold, the hand replayer still shows your hole cards, but in a faded colour. The hand replayer shows your info with a different background colour to the other players. This lets you find yourself in the replayer immediately. 1. Download the latest version here.